Disruption is all around us, from Amazon changing the face of retail to media moving from radios and TVs to mobile devices. Add this to the list: science is finding simple, free, or cheap things can improve our health without expensive prescription medication. As we recently reported, researchers have concluded that walking up and down stairs for 10 minutes boosts energy levels better than coffee or energy drinks that contain caffeine. It's not only free, it can also improve heart health. Now, researchers at Wake Forest have come up with another disrupter -- simple exercise and drinking juice made from beet roots may be the closest thing yet to a Fountain of Youth. Writing in the Journals of Gerontology: Medical Sciences, the researchers claim the combination improved brain function in older people to more closely match that of a much younger adult. Beets have long been considered a health food because they are rich in dietary nitrate, which the body converts to nitrite and then nitric oxide. Nitric oxide is particularly efficient in the body because it increases blood flow and targets areas that need it. The researchers say exercise is good because it increases blood flow to the brain. The shot of nitric oxide from the beet juice just boosts the effect. The researchers site a number of previous studies that link nitrate in beets to better physical performance among people of all ages. It's credited with helping people who suffer from chronic obstructive pulmonary disease (COPD), diabetes, and hypertension. 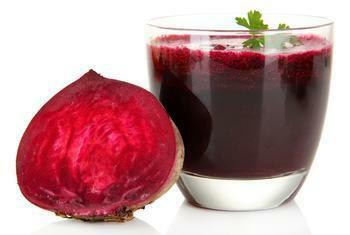 This is the first time, however, that scientists have suggested beet juice might counter some of the effects of aging. There's just one problem the researchers acknowledge. Beets are not exactly a culinary delight. At least, not everyone thinks so. For those who are not so fond of straight beet juice, the Wake Forest researchers have thoughtfully pointed us to some recipes that might make getting that nitric oxide shot a little more palatable.